For my first article on Bowsite I gave Bowsite's visitors some tips for choosing the perfect arrow. 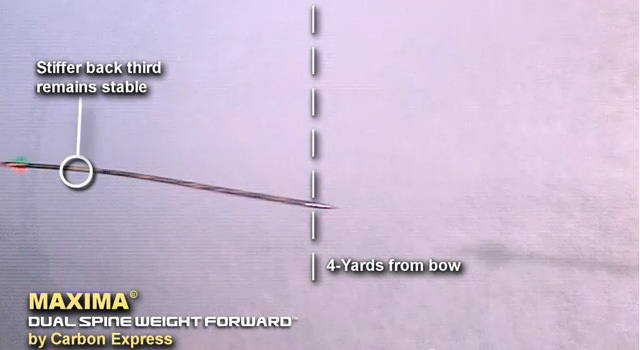 That generated a lot of questions about the science behind Dual-Spine, Weight-Forward (DSWF) arrows. This article dives deeper into what it is and how it helps both penetration and accuracy. I shoot arrows to hunt, so when I heard that dual-spine, weight-forward arrows were better for broadheads I immediately went out and bought a dozen. I really didn’t understand what it all meant. Was it all just hype? Did I fall for some marketing gimmick? I reached out to Carbon Express’s arrow guru, Lenny Rezmer, who gave me a one-hour tutorial on arrow performance and explained what DSWF is all about. For starters, let’s look at Dual Spine. There are two types of spine to consider on an arrow; dynamic spine and static spine. So when an arrow is designed with Dual spine, both spines are considered and properly accounted for. Static spine is how an arrow is gauged. 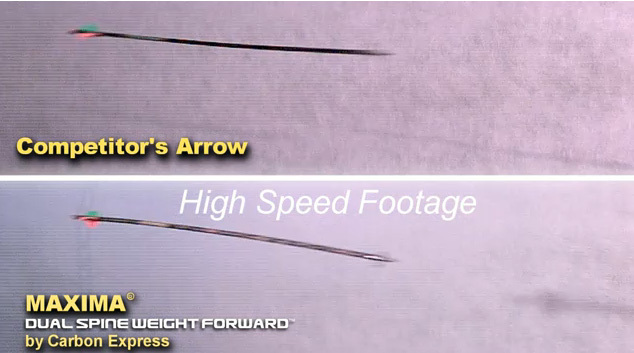 It is how much deflection (bend) the arrow has on a 28” shaft with a weight (just over a pound) hung from the center. When you see a number on a shaft, it is generally static spine. For example, a 250 spined arrow bends 250/1000 at 28”, where a 350 bends 350/1000 at 28”. The dynamic spine is how the shaft reacts (or bends) at actual thrust when the energy from the released bowstring is transferred. It factors in to how 'forgiving' the arrow is and how quickly it recovers. So with the DSWF arrows, both spines are considered. The weight forward part means that the front end is heavier and flexes more for forgiveness as well as keeping the arrow on track better. The back third of the arrow is lighter, and fairly stiff, for much quicker recovery while getting the arrow on track quickly. DSWF arrows are made from a multi-layer material to achieve dual spine, and this also has the added benefit of making the arrow spin 20% sooner. That is an obvious advantage for accuracy. So…DSWF delivers terrific groupings and is easy to tune because high-speed bows put a tremendous load on the arrow upon release which causes the arrow to flex and oscillate when fired. 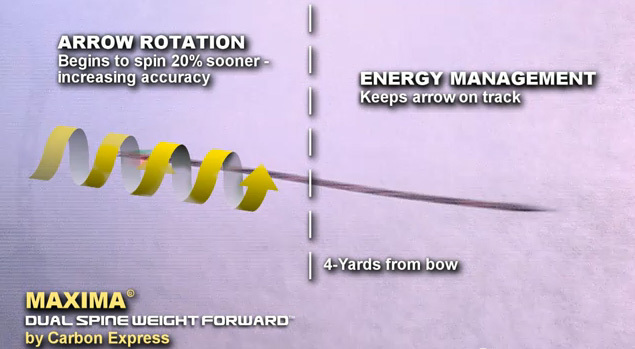 Managing this energy transformation is the key to making arrows shoot better. Dual-spine technology better manages energy from the bow to the arrow, and improved energy-management causes the arrow to spin sooner and recover faster. 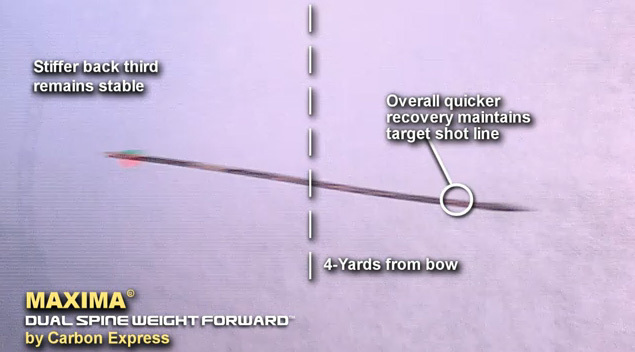 Arrows that recover faster are more accurate. 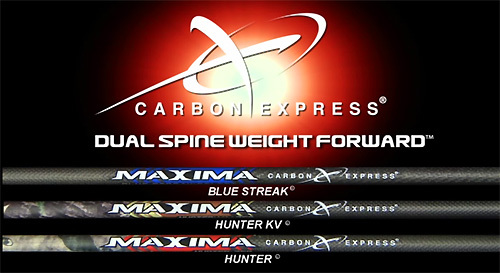 The CX patented multi-layer, multi-material spine construction creates two arrow spines in one: a lighter and stiffer back harnesses energy to get on track faster and a heavier front end maximized forgiveness to stay on track better. Finally; spinning sooner means shooting straighter for superior accuracy which helps you to shoot better. OK, now we have all the technical stuff taken care of, what are the real results of this, and how can it help us as shooters and hunters? Carbon Express did a blind test with 8 professional shooters and they shot groups with DSWF and non=DSWF arrows with broadheads. The results were that at 40 yards, the average was 50% tighter groups with DSWF arrows. I don’t know about you, but I would sure like to shoot 50% better groups at 40 yards, especially with broadheads! This technology will help hunters be more accurate with their shot placement on game, as well as extend their effective and ethical killing range. If you shoot more accurately, you will kill more cleanly. If you can shoot better groups at long range, it is more ethical to shoot animals at further distances. The benefit to competitive shooters is also obvious. If you can shoot more accurately, especially at distance, you will win more tournaments. Isn’t this what we all want? to shoot better whatever our application? After learning the science behind DSWF, I know that you won’t find my quiver without these type arrows. I want every advantage I can get when I shoot my bow at a target or a big elk, and I am confident that DSWF gives me a definite performance boost over conventional arrows. But don't take my word for it. Go to your local pro shop and compare DSWF arrows to traditional arrows. I think you'll find the difference is quite dramatic.